This beautiful little hardcover coffee table book only measures about 5″ x 8″ and 64 pages. If you leave it out, it will be one of those books all of your guests will be drawn to pick up and flip through. Jack Levin is an artist. 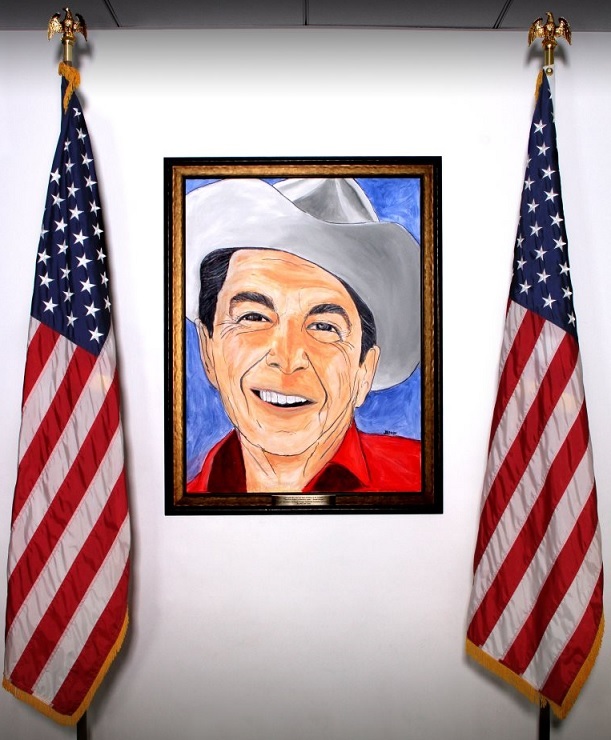 His magnificent painting of Ronald Reagan seen below hangs in the Reagan library in Simi Valley, California. 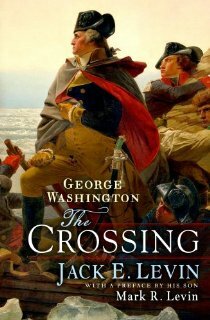 You can see that an artist designed George Washington The Crossing. The pages are high quality thick paper giving the reader a pleasant tactile sensation. Each page has a strikingly expressive gray marble background which perfectly fits the mood of this story. I appreciated the amazing artwork, photographs and maps which gave such visual appeal to the eyes on every single page. Most of my friends who will read this review are patriots, therefore, I will warn you now, this book is a tear jerker, have a kleenex tissue on hand. The preface written by one of our beloved conservative heroes, Mark Levin, gives us insight to his childhood with his parents and his two brothers and shows us how his love for history and America began at a young age, instilled in him by his family. Talk show host, Sean Hannity, who nicknamed Mark Levin as the “great one,” called Jack Levin the “greater one” on his radio show the other day. Adorable. Recently Mark Levin has been reading excerpts of the book on the radio and the way he reads it, brings you back to an old fashion simpler time before this high tech world that exists now. I respect and admire Jack Levin for who he is, what he has accomplished in his life and the message he brings us with this book. Mark Levin and Jack Levin remind me of the men in my family, my Dad and my Grandfathers. Mark Levin and his father marketed this book as a Father’s Day gift. My dad passed away several years ago but if he was alive, he would have absolutely loved this book! The story is about the battle of Trenton and the days leading up to it. We all were taught this story in high school but Jack Levin delivered it in such an intimate way that I felt like an angel on George Washington’s shoulder. I saw this period of time come to life with the vivid words and the pretty artwork and the author made me feel like I had actually been there. It is a quick and poignant read. Some of General Washington’s own words were used in this book from a letter in response to the president of the Continental Congress, John Hancock. The writer was thoughtful enough to print Washington’s actual words in red lettering. Abraham Lincoln’s words and thoughts on the struggle at Trenton are included in the book also. I have always loved the opening words to The American Crisis by Thomas Paine. Paine’s piece, which is partially printed in Jack Levin’s book, is profound, motivational and it was a turning point that inspired our soldiers to fight another day. I have said it before as well as many other people but Mark Levin, (and Jack Levin too) are really the Thomas Paine(s) of our day. Here they are once again ennobling their readers , the American people, to dust themselves off after our last election loss and fight this iron fisted tyranny day after day, even on days when we feel like it’s too much for us, even on days when it seems impossible. We have all heard about the icy condition Washington and his men faced as they crossed The Delaware River. Jack Levin shows photographs of ice floes in this area of the Delaware River and photographs of the durham boat which was the type of boat our army used. Seeing these photographs should give the reader a new appreciation for the danger these men were willing to face in order to spread the message that man should rule himself. “An American officer wrote: It will be a terrible night for the men who have no shoes. Some of them have tied old rags around their feet; others are barefoot, but I have not heard a man complain.” When you look at the photograph of the amount of ice which accumulates on this river and the paintings of the horrible weather, with our modern day conveniences, it is hard to imagine the intense physical pain these men must have undergone. Many of these great warriors didn’t have the proper clothing for Winter and a multitude endured this without shoes. It is impressively heroic what they did for us and we should never forget it. My favorite parts of the book are the ending and then the “author’s note” which were very inspirational words, encouraging the American citizens of 2013 reminding no matter how sad we are with what has happened to our country today, our republic has been through rough times before and the American people will always find a way to triumph. I won’t spoil what Jack Levin says but there is a reason Americans will repeatedly find a way to win. The cause is the reason. When two forces do battle, the side with the greater incentive will continually make headway. Our cause and incentive is; God created man to live free and because of George Washington and a handful of others, for the first time in human history, they did. Freedom is not the norm, tyranny is the norm. Individual sovereignty, personal property rights and liberty is the exception, and that is what President Obama does not understand about American exceptionalism. Jack Levin’s book about history becomes hugely relevant when glancing at this months breaking news. George Washington’s army was the force for liberation and the King’s Men were the force for conquest which is why the American’s beat the odds. Today, big government is spying on both the press and the people and shredding our Bill of Rights more each minute. This Federal leviathan is the force for conquest. We must remind our fellow patriots that the members of the conservative movement of 2013 is the force for liberation. Please read George Washington The Crossing to your children. They will love it and future generations need to be taught this true tale. This is the world’s greatest underdog story, the worlds greatest comeback story and at the end of the day it is the world’s greatest love story. It’s proof that the love of liberty is a cause great enough to overcome any obstacle and move any mountain. The principles and ideas that founded this country are exceptional and from God, and men will always be divinely inspired by these ideas and willing to risk their life for this reason. “Give me Liberty or Give me Death,” “Victory Or Death,” these revolutionary sayings are more than simply words. They are from the heart and soul. Anyone who has a love of family and a love of country should buy this book. I promise it won’t disappoint you. Happy Belated 88th Birthday to Jack Levin! 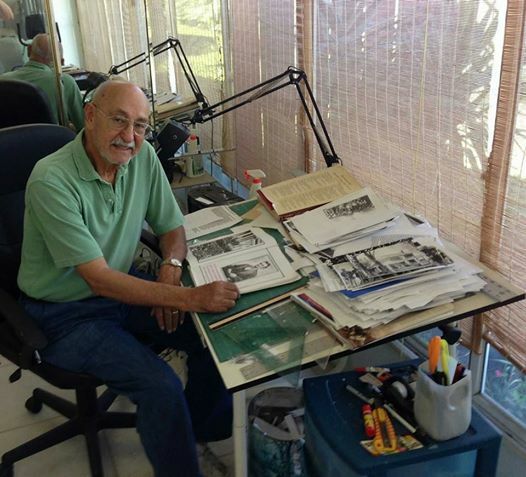 On Aug. 23, 2014 Mark Levin posted a photo of Jack Levin working on his new book, Malice Toward None! 2014 Update: This review has had so many views I wanted to add this photo. Since Mr. Levin loves history and art I gave him this gift. 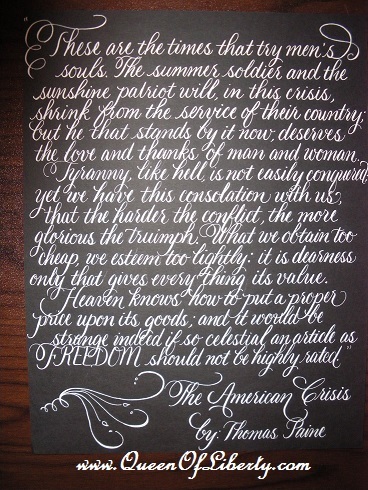 Almost two years ago I sent Jack Levin a copy of a portion of The American Crisis done in calligraphy ready for framing. It’s white ink on black paper. This type of script is very time consuming but it is really beautiful and is a labor of love. I wanted to share it with all of you too. « Men Are From Mars? I’m broke but you talked me into buying the book. I forgot to tell you but I did like this book. I had never heard of Jack Levin before you mentioned it. I’m going to order his Lincoln book coming out next week. I look forward to it. I got this book because of my love for history. I’ve been reading books on American history, ever since I was in high school and have accumulated broad knowledge on our founding and the people involved in it. Having said that, I come to the conclusion that this book is heavily overpriced because I wouldn’t even call it a historical book, considering the length and depth of its contents. It contains a lot of (average) pictures that you probably have seen before, if you lived in the US for longer than 5 years or ever watched a documentary on Washington on the History Channel. I wouldn’t per se say it’s a bad book because I had lots of fun reading it to my 5-year-old the other night and it instantly became his favorite story book. This book is definitely not what it tries to be – a serious in-depth book on the battle of Trenton. It fails its aspiration of giving the reader a feeling of what it was like for the troops crossing the Delaware River. I’d give this book a 3-star rating if it were under “children’s book” or had a price of approx $5. However, compared to the way it is promoted and considering my deep disappointment I can’t give this book more than one star. I disagree with you. Heavily overpriced? Really? It is $10.79. The Taco Bell lunch special of 3 chicken tacos and a soda cost more than $10.79. Where is all of this “promotion” that bothered you so much? The description on Amazon is brief and accurate. It tells you how many pages it is. I think it was promoted as exactly what it is: a beautiful inspirational little book to give hope to the average American. Nobody ever said it was a lengthy intellectual college text book. I think it is artsy and unique. It’s actually hard to find cool stylish coffee table books on the topic of American history. One star? Jack Levin is an 88 year veteran who served this country. You, sir, should have more respect! Most people don’t even live to be 88, let alone write a New York Times best seller. That’s an amazing feat. I’m proud of Jack Levin for all of his service to the country including this book. When I don’t want to buy something, I simply don’t buy it. I’ve never gone out of my way to try to hurt somebody and their art or creation the way you just did to Mr. Levin. The pretentious garbage you wrote here only reflects poorly on YOU. This appears to be an interesting book. I will give it a read. Thank you for the recommendation. You will love it Janice! I read this book today. It was wonderful. Thank you for the nice review. I could not say more. Great review. I didn’t know Mark Levin’s father was a writer. I heard Mark reading this book on the radio today. When I googled it, this came up. Thank you for posting photographs of Jack Levin’s painting. Interesting site. I’ll check out other posts here. No, but if you search it on my site, I have a list of dozens of reviews from other people and there are videos as well. Check it out. God bless you Roy. Great review. I never heard of this book before. 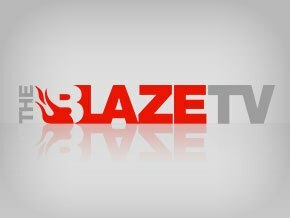 I am a Constitutional conservative who reads avidly about the founders. Thank you for the recommendation. Thanks, you will love it Art. I am an art student. I love Alexis Deacon’s art and the calligraphy she does in reference to American History. I know how time consuming and expensive calligraphy is and it’s a lost art form. I had never heard of Jack Levin before but I purchase three of his books based on this review and recommendation. Very glad I did. They are beautiful and I treasure them. Thank you Alexis. Thank you Ceres for the compliment. Yes, I agree with you. -> All of Jack Levin’s books are stunningly beautiful!! !